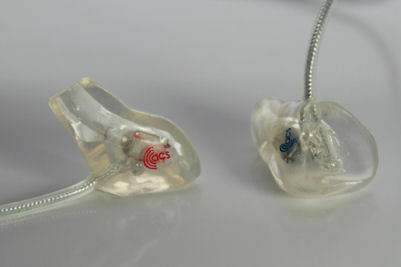 The T3™ is our original single driver in-ear monitor. Extremely lightweight and with superb frequency response, the T3™ this ideal for personal listening and mix monitoring. T3™ in-ear monitors are individually crafted to fit you ear perfectly giving isolation from outside noise and allowing you to wear them for hours at a time with no aching or fatigue. The T3™ uses a single balanced armature transducer which offers a broad frequency response and unbeatable clarity whilst requiring little power, making it ideal for use with portable players and other low output devices. Both the silicon moulding and the resiliant design of the balanced armature make the T3™ very resiliant to impact and shock so its ideal for use on the move in more unforgiving environments. Please contact us for cable and laser etching options. Click here for references and here for the ACS website.